Our 35 boxes league table that catalogues key events on the road to the Academy Awards sets aside two boxes for the SAG Awards: an individual acting win and best ensemble. And none of the three films who were nominated for both (“Bohemian Rhapsody,” “BlacKkKlansman,” and “A Star is Born”) managed to do that. 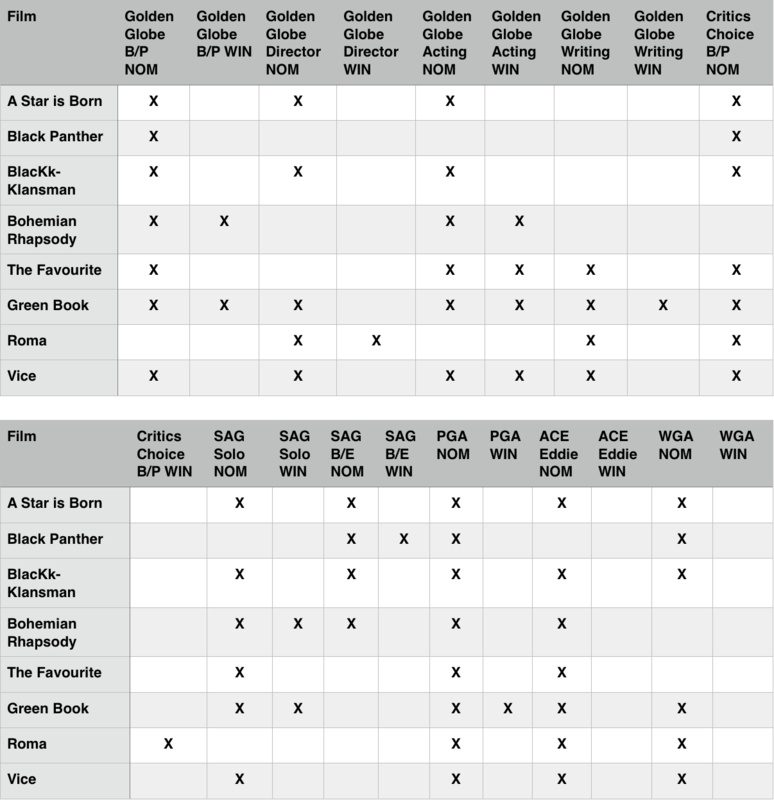 Only three of the eight Best Picture nominees earned a tick – and two of those three are the bottom ones in this theory. 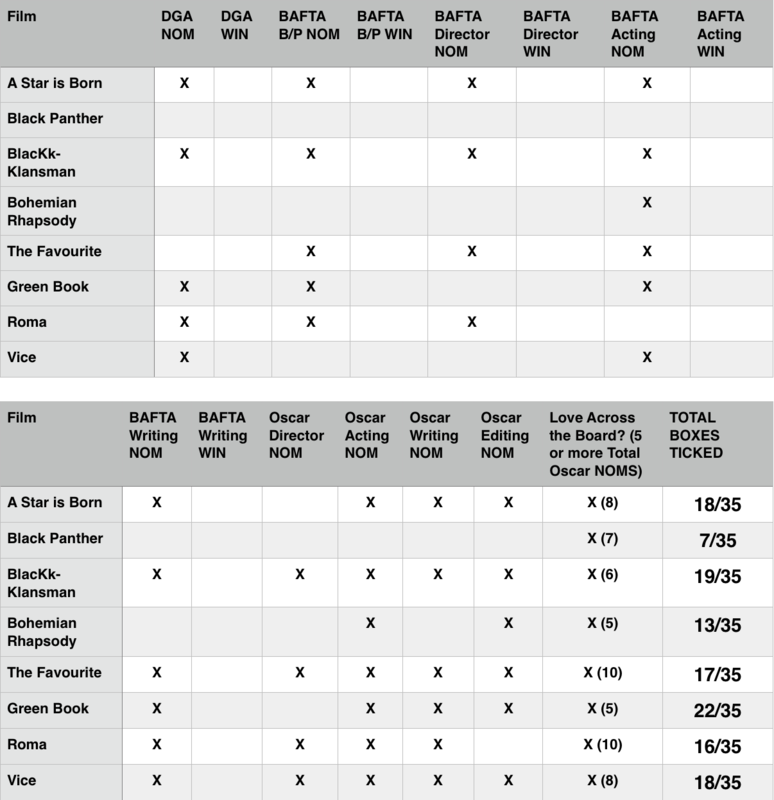 “Black Panther” deservedly won Best Ensemble and moves up to seven but boxes ticked, But it still remains in eighth place and a long way off changing that position. Rami Malek won Best Actor for “Bohemian Rhapsody,” which moves up to 13 ticks and stays in seventh place. The third film to earn a check was “Green Book,” with that Supporting Actor win for Mahershala Ali. That extends its lead at the top to 22 boxes ticked. It’s now three ahead of Spike Lee‘s “BlacKkKlansman,” which failed to capitalize on a great chance to position itself as a Best Picture favorite. This Oscar race is moving speedily ahead. Next up are the ACE Eddie Awards on the 1st of February, which will be followed by the DGA Awards the very next day. Stay tuned!